President Barack Obama is sharpening the focus on trade, commerce and economic growth at the Asia-Pacific Economic Cooperation (APEC) summit in Manila on Wednesday. The U.S. leader is speaking to business leaders during a CEO summit and will meet with the 12 signatories to the Trans-Pacific Partnership (TPP), a free-trade bloc that still must be ratified by member nations. The U.S. leader is pushing to finalize the massive TPP deal, a key component of the Obama administration’s rebalance to the Asia-Pacific. The White House has pointed to the region as a populous, vibrant and economically promising part of the world where America must engage more closely on security and economic issues. Obama met Wednesday with Philippine President Benigno S. Aquino III. After the bilateral talks, Aquino said that the most critical element of sustainable growth is inclusivity. On Tuesday, maritime disputes in the South China Sea took center stage when Obama pledged to help Asia-Pacific allies boost their maritime security. "My visit here underscores our shared commitment to the security of the waters of this region and to the freedom of navigation," said Obama. The White House announced a package of up to $259 million in new aid over two years, including $79 million for the Philippines, $40 million for Vietnam, $21 million for Indonesia and $2.5 million for Malaysia. The U.S. is also transferring a Coast Guard cutter and a research vessel to the Philippines. Earlier Tuesday, Obama toured the Philippines’ naval flagship, the BRP Gregorio del Pilar, which once belonged to the U.S. Coast Guard but now operates counterterrorism missions and patrols disputed areas in the South China Sea. 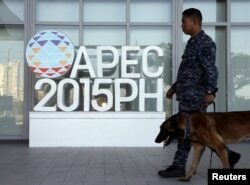 A military personnel walks past an APEC logo with his sniffer dog at the media center of the Asia-Pacific Economic Cooperation (APEC) summit in the capital city of Manila, Philippines November 17, 2015. Beijing’s territorial claims in the region have raised tensions with surrounding countries, including the four involved in the new U.S. aid package. “More capable navies and partnership with the United States are critical to the security of this region," Obama said. The leaders of 21 economies and other heads of state are gathered in Manila for the influential APEC summit. Chinese President Xi Jingping also is in Manila for the summit. President Barack Obama, right, shakes hands with Philippines Minister of National Defense Voltaire Gazmin after arriving at Ninoy Aquino International Airport in Manila, Philippines, Tuesday, Nov. 17, 2015. While the Obama administration is focusing on trade during the talks, efforts to battle Islamic State militants will also be a key topic after Friday’s deadly attacks in Paris. Obama spoke about the battle against the Islamic State during a bilateral meeting with Australian Prime Minister Malcolm Turnbull on Tuesday. "We will continue shoulder to shoulder with the United States and our allies in the fight against this type of extremist violence, this type of terrorism," said Turnbull. Obama praised Australia as "the second-largest contributor to the counter-ISIL coalition." Later in the week, Obama will travel to Kuala Lumpur, Malaysia, to take part in the annual summit meeting of the Association of Southeast Asian Nations (ASEAN).